When using the mailbox.org web interface in combination with Guard, any OpenPGP keys needed for securely communicating with other Guard users can be retrieved automatically. 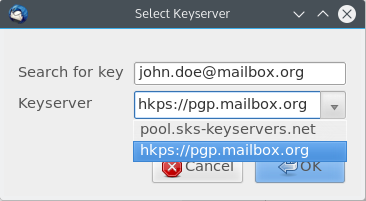 For external senders using e-mail clients like Mozilla Thunderbird, we have an HKPS key server that offers verified OpenPGP-keys of mailbox.org users for import to a local key ring. What is different to other key servers is that ours will only distribute verified keys of mailbox.org users. It is not possible to manually upload fake keys for other e-mail addresses to our key server. Please make sure to use GnuPG 2.0 or a newer version as our key server will only accept encrypted connections. Lower versions (1.x) of GnuPG (gpg) will only support SSL encryption with the add-on module gnupg-curl installed. There are also binaries available for other operating systems like Windows or Mac OSX (please consult the GnuPG download page). Thunderbird supports the Enigmail add-on for the management of encrypted e-mails. This add-on can access our key server if the address is specified in its configuration. 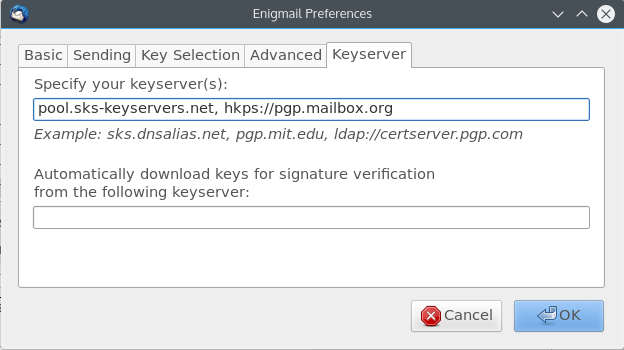 To do this, open the Enigmail settings and click on the tab Keyserver. There, add the mailbox.org HKPS server address. In the future, if you ever need a key of a mailbox.org user, select our key server to import a verified key to your local key ring. Some installations of GnuPG2 are known to have problems locating CA root certificates correctly. This is due to the SSL library being supplied by the operating system, which happens to prevent the automatic validation of our HKPS server certificate under the default configuration. In these cases, users will experience a general server error when attempting to search for keys. This problem has been noticed with GPG4WIN in particular, but may also occur on Ubuntu 16.04 and other Linux distributions. In order to address the issue, users need to configure GnuPG and specify which CA root certificate it should use to validate the server certificate. GPG4WIN (GnuPG versions 2.0.x): Please download the CA certificate file SwissSign_Silver_CA_-_G2.pem and save it locally on your computer. Make sure to edit the path so that it points to your downloaded certificate file. Enigmail: Users of Enigmail for Mozilla Thunderbird do not need to edit any configuration files manually. Instead, the settings can be changed directly through the Enigmail configuration tool. It is possible to configure GnuPG to automatically retrieve from our key server any PGP keys that are currently not available at the client side. On MS Windows, the file gpg.conf is usually located in "%APPDATA%\GnuPG". On Linux systems, it can be found in "$HOME/.gnupg". Users of MacOS X can simply use the tool GPGPreferences to make any changes. We should mention that the auto-key-locate feature of GnuPG has been subject to critical discussion among privacy advocates. Although searching and finding of encryption keys will be automated and thus, vastly simplified, there are also possible privacy implications. A key server operator could theoretically log any connections made by individuals to the server and so create communication profiles of these individuals. The GnuPG documentation contains explicit warnings about this. However, if key server and mail server are operated by the same organization (as is the case with mailbox.org), these privacy concerns are no longer an issue. This is because the information obtainable from the key server communications would not add anything new to what is already known to the mail server instance.